Definition - What does Pose Dedicated to Sage Nahusha B mean? 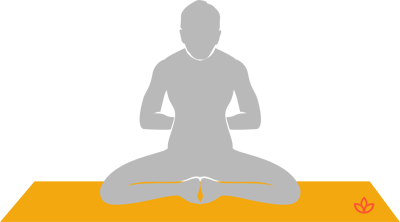 Pose dedicated to Sage Nahusha B is one of several advanced variations of the seated pose known in Sanskrit as Nahushasana. All of the variations require flexibility in the hips, ankles and legs. They differ in the positioning of the arms and upper body. For the pose dedicated to Sage Nahusha B, begin in butterfly pose. Lifting the pelvis, twist the ankles so that the toes point behind and the feet are guided under the body. The hands reach behind the back in reverse prayer position. Depending on the instructor, the body may rest on the feet or it may hover just above the feet with the knees supporting the weight of the body. The gaze is toward the nose. In the A variation of the pose dedicated to Sage Nahusha, the back and neck arch as the hands reach behind the body, resting either on the ground or on the feet. In the C variation, the spine is perpendicular to the ground and the hands rest on the knees while holding jnana mudra, palms facing skyward. All three variations are included in the fourth series of Ashtanga yoga, one of the more advanced vinyasas. Yogis with wrist, shoulder, ankle, foot, hip or knee injuries should avoid this posture.